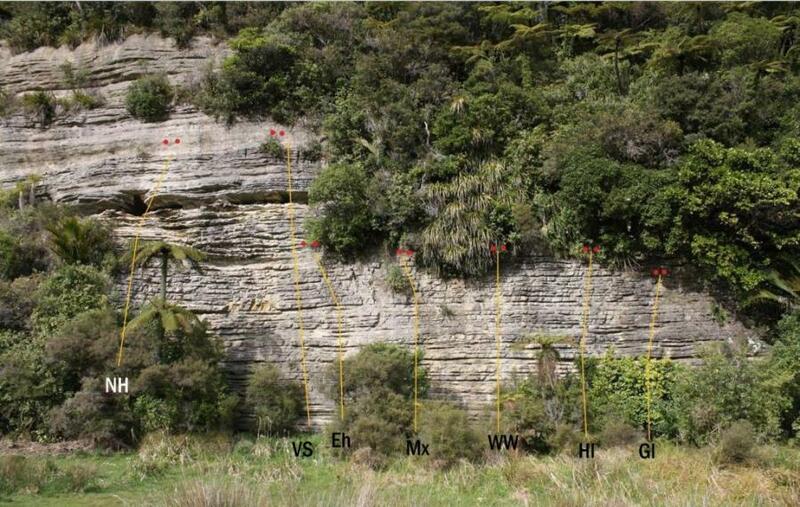 Weka Wall is a very accessible, bolted crag very close to the Punakaiki River bridge. Climbs are between 8m and 18m high. All climbs have anchor bolts. The crag was developed by Neil Silverwood and Heidi Godfrey in September 2009. At the Punakaiki river bridge turn left onto gravel road, open gate next to cattle yards, shut gate, drive 200m and Weka Wall is located on your right. ABSOLUTELY NO CAMPING IS ALLOWED ON THE PROPERTY/FARM LAND. Access to climbing relies on this being adhered to!! Weka Wall’s first few routes were developed during a rainy spell and remained dry the whole time. 10-20m upstream of WW is a small resurgence, this water is part of the Punakaiki town water supply so please do not toilet within 100m either side or contaminate this water. Weka Wall is also home to Weka and Pukeko, please do not feed the birds. Any queries, feedback contact Neil Silverwood neilsilverwood@hotmail.com or Heidi Godfrey heidi_godfrey@yahoo.co.nz. It is highly recommended to wear a helmet at the base of the crag. Straightforward apart from the roof near the top. Hands down best climb on the wall. If only Silverwood could put up a route this good. Missing hangers at the moment? Bit of a tricky start but turns into a delightful little number. Something to do when you've done the rest. Weka Watch has all its hangers. Max has only one hanger so far, but does have another 3 bolts ready to go, the lowest (fifth?) bolt is flush with the face (unless there is a fifth bolt out of sight somewhere near the top). Description for Hansel seems more apt for Weka Watch. I couldn't send the first move on Weka Watch at all, in fact I had to move to 'Hansel' to get a start and then step back over onto Weka Watch.